A cast glass pendant made from small opaque and transparent fusing glass pieces. 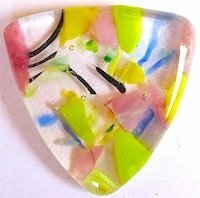 The item is kiln formed in a commercial glass fusing mold and produces a pendant 1.75 inches wide. Gaps in the top layer are filled with pieces of medium frit. This item is made from scrap lengths; always keep your scrap as you can use it in many different ways. This project can be made from Bullseye or System 96. There are a number of ways to make the small bits you will need. You can cut them with a cutter, break them off with grozing pliers or use wheeled mosaic nippers. I find it is easier to use wheeled mosaic nippers as you can nip the pieces in half very quickly if you need to. Safety glasses must be worn when cutting the scrap. If you are using mosaic nippers cut along the edge so that you can control the size of the offcuts. Try to hold your hand around the nipper so that the cut bits fall into your hand. If you have a pair of safety gloves wear one on the hand catching the offcuts, many nipped offcuts will have needle sharp ends. Use tweezers when placing the offcuts into the fusing mold. Wash and dry the scrap before cutting, as it is very difficult to clean after cutting. Try not to hold the scrap in the areas that you are cutting. Step 1. Apply kiln wash to casting mold. Step 2. Cut scrap to size. Step 3. Place clear bits into bottom of dry mold. Step 4. Put pieces of opaque and patterned glasses over bottom layer. Step 5. Apply clear top layer, build up slightly towards the center to help counter shrinkage. This happens because the material tends to compact downwards and may end up two thirds of its original thickness. 300 F (150C)/hour up to 1470 F (799 c). Check to ensure that item is fully fused. This cast pendant can be further worked by adding clear dichroic to the bottom or top and kiln fuse again. A mixed frit blend can be placed in bottom and the pendant kiln fired again. This type of mold is ideally suited for producing a large pendant as extra layers will increase the size and weight of the finished art jewelry piece.